I love the double stamping here! The tiger looks awesome too. Oooh! Beautiful! The double stamping is gorgeous! Lots of depth with the double stamping...it's stunning! oh my, these are FANTASTIC!!! what polishes did you use for stamping? they are so vibrant! I used Konad stamping polish in green for first layer and Barry M Gelly Key Lime for the bamboo. Those Barry M's are great stamping polishes. And.....gorgeous on their own with no top coat. Thank you! There is so much depth in this design! Amazing! Very cool. You definitely succeeded in getting some depth with your layered stamping! I love Tigers - this is gorgeous! This is stunning! Those polishes are so vibrant even with the double stamping - gorgeous! This is one amazing work of art! Ahhh! He's SO cute!! I love this idea! Wow these are great! 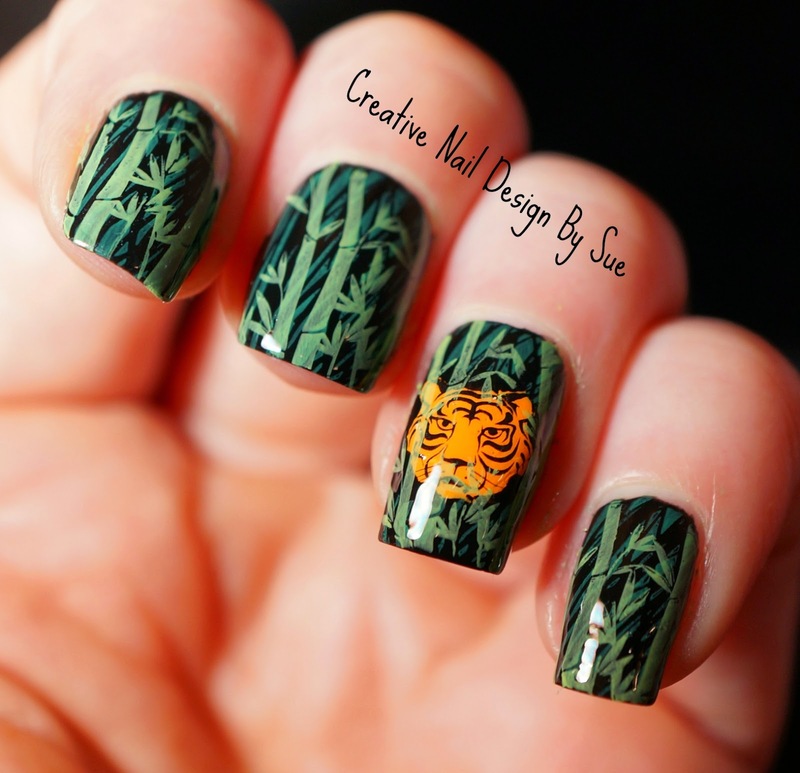 I love bamboo and that tiger is awesome! What plate did you use for the image under the bamboo? Good question. I would guess its a BM but it looks like long thin blades of grass going in opposite directions like it's blowing in the wind.